MATRIX ALB7xe 41 cm / 16" touchscreen display with FitTouch Technology offers intuitive operation. WiFi connectivity accommodates optional Matrix Asset Management system, Workout Tracking Network and Personal Trainer Portal. Compatible with xID single-point user sign-in for a seamless personal experience. Custom interface configuration facilitates personalized communication with users. Advanced Sprint 8 High Intensity Interval Training program. Compatible with Virtual Active programming to provide an immersive exercise experience. Optimized app interface designed specifically for fitness. Compatible with IPTV. RFID compatible to provide touch-free login. Compatible with most smartphones and tablets for video, audio, charging and on-screen playlist selection. Vista Clear Television Technology offers the most vibrant picture quality in the industry. Integrated 3-speed personal fan. Premium footpad insert enhances user comfort. 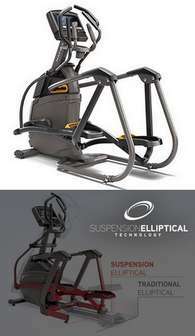 Adjustable incline and resistance for greater workout variety. 51-61 cm / 20-24" adjustable stride length for increased range of motion. MATRIX ALB3x LED console display with expanded feedback offers intuitive operation. WiFi connectivity accommodates optional Matrix Asset Management system and Workout Tracking Network. Compatible with xID single-point user sign-in for a seamless personal experience. USB port offers charging for most smartphones and tablets. Adjustable incline and resistance for greater workout variety. 51-61 cm / 20-24" adjustable stride length for increased range of motion. MATRIX ALB5x LED console display offers intuitive operation. WiFi connectivity accommodates optional Matrix Asset Management system and Workout Tracking Network. Compatible with xID single-point user sign-in for a seamless personal experience. Sprint 8 High Intensity Interval Training program. RFID compatible to provide touch-free login. USB port offers charging for most smartphones and tablets. Integrated 3-speed personal fan. Premium footpad insert inhances user comfort. 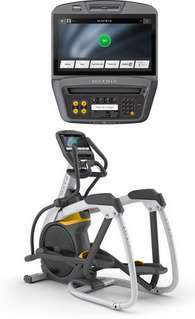 MATRIX A3x Adjustable incline and resistance for greater workout variety. 51-61 cm / 20-24" adjustable stride length for increased range of motion. 20-33 cm / 8-13” step-over height engages glutes, hamstrings and core stabilizer muscles. Low 24 cm / 9.5" step-on height for easy accessibility. Constant Rate of Acceleration and our patented suspension design delivers a perpetually smooth motion free of wheels and tracks. Contralateral action with tapered, dual action handlebars mimics the body’s true movement and proper fit. Ergo Form Grips with integrated controls enhance comfort and accessibility of key functions. MATRIX ALB7xi 41 cm / 16" capacitive touchscreen with FitTouch Technology offers intuitive operation. 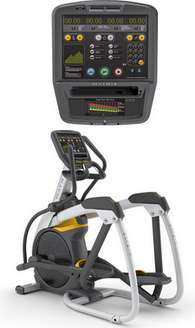 WiFi connectivity accommodates integrated Matrix Asset Management system, plus optional Workout Tracking Network and Personal Trainer Portal. xID single-point user sign-in offers a seamless personal experience. Custom interface configuration through Matrix Asset Management facilitates personalized communication with users. Advanced Sprint 8 High Intensity Interval Training program. Integrated Virtual Active programming provides an immersive exercise experience. Optimized app interface designed specifically for fitness offers easy access to social media and web content. Compatible with IPTV. RFID compatible to provide touch-free login. Compatible with most smartphones and tablets for video, audio, charging and on-screen playlist selection. MATRIX A5x LED console display offers intuitive operation. WiFi connectivity accommodates optional Matrix Asset Management system and Workout Tracking Network. Compatible with xID single-point user sign-in for a seamless personal experience. Sprint 8 High Intensity Interval Training program. RFID compatible to provide touch-free login. USB port offers charging for most smartphones and tablets. Integrated 3-speed personal fan. Premium footpad insert enhances user comfort. Adjustable incline and resistance for greater workout variety. MATRIX A3xe Self-powered system provides cost-savings and freedom of placement within facility. Removable disk for easy serviceability. Ergo Form Grips with integrated controls enhance comfort and accessibility of key functions. Contralateral action with tapered, dual action handlebars mimics the body’s true movement and proper fit. Constant Rate of Acceleration and our patented suspension design delivers a perpetually smooth motion free of wheels and tracks. Low 24 cm / 9.5" step-on height for easy accessibility. 20-33 cm / 8-13” step-over height engages glutes, hamstrings and core stabilizer muscles. 51-61 cm / 20-24" adjustable stride length for increased range of motion. 7xi: Better Brought to Life: The 7xi changes the way you connect and communicate with your members. It revolutionizes the way you manage your equipment, your facility and your data.Intuitively designed so your members don’t have to break their rhythm to access entertainment, social media and facility communication. MATRIX A7xe Allow your members to escape to exotic locales like the lush forests of Hawaii or the majestic Grand Canyon, all within your facility’s walls. 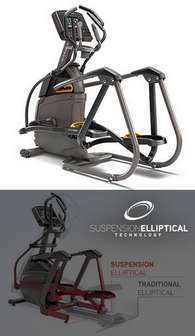 Comes w/ SPRINT 8 Interval Training.Experience an amazingly smooth, exceptionally comfortable full-body workout thanks to our exclusive Suspension Elliptical Technology and PerfectStride Motion. Our A50 Ascent Trainer includes our exclusive Exact Force Induction Brake , power incline and an expanded suite of integrated convenience features. Our XR console features a clean, bright display that makes it easy for you to check your workout data at a glance, keeping you on track to reach and surpass your goals. Smooth, precise resistance changes. Passport Ready. 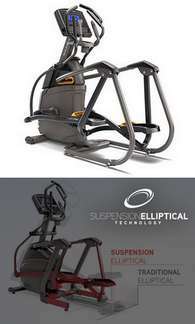 Comes w/ SPRINT 8 Interval Training.Experience an amazingly smooth, exceptionally comfortable full-body workout thanks to our exclusive Suspension Elliptical Technology and PerfectStride Motion. Our A50 Ascent Trainer includes our exclusive Exact Force Induction Brake, power incline and an expanded suite of integrated convenience features. Our XER console includes a clear display and an intuitive home screen that offers easy access to entertainment. Includes Bluetooth connectivity. Smooth, precise resistance changes. Touchscreen console. Comes w/ SPRINT 8 Interval Training.Experience an amazingly smooth, exceptionally comfortable full-body workout thanks to our exclusive Suspension Elliptical Technology and PerfectStride Motion. Our A50 Ascent Trainer includes our exclusive Exact Force Induction Brake, power incline and an expanded suite of integrated convenience features. Our XIR console includes a stunning HD display and an intuitive home screen that offers easy access to entertainment. Includes expanded Bluetooth connectivity to user devices.Smooth, precise resistance changes. Touchscreen console. 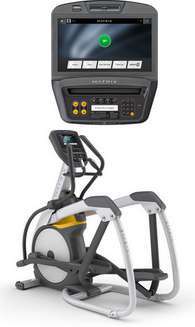 Arizona Extreme Fitness will deliver and setup your favorite quality Matrix Elliptical Ascent Trainers for home or commercial use in Prescott, Flagstaff, Sedona and Phoenix, Arizona at your location. Come on in and browse our 3000 sq ft warehouse showroom in Prescott Valley, Arizona and try before you buy or if you already know what you want just call us for our best price and we will deliver or ship it to you depending on your location in the USA. 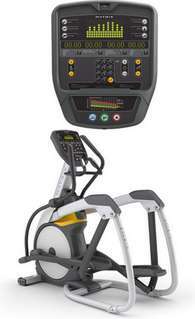 We sell, deliver, setup, install and service the above Matrix Elliptical Ascent Trainers and more.